Today is the Feast of Christ the King. In the great scheme of things, it is not an ancient feast day – since it was only really established in the twentieth century. So, why do we need a feast of Christ the King, anyway? Well, today is the last Sunday of the Church’s year. Over the course of a liturgical, church year, we have the entire story of Jesus of Nazareth, his life, his work, his death, his resurrection, and his ascension to sit at the right hand of God the Father. In seven days’ time, it will be the first day of a new Church year – the first Sunday in Advent, when we begin the entire cycle all over again, starting with the Old Testament prophecies of the impending Messiah who would save the world, then the birth of said Messiah, and so on..... all the way through the year. Since the start of the church year catalogues the story from the very first principles, and we then follow Jesus’ life and work all the way through, it makes sense to have some bookends to the Church year. If one bookend is on Advent Sunday and starts at the very beginning, then it makes perfect sense, does it not, that the last Sunday of the Church year would unambiguously describe the culmination, the summation, the zenith, of everything that the whole Church year had been leading up to: which is this – that after him being predicted, then born, then active in his ministry, dying, rising from the dead and ascending back into heaven, his rightful place at the end of this cycle of being is at the right hand of his Father, crowned the King of Kings, and Lord of Lords: the apocalyptic event which was seen in a vision by the prophet Daniel, which we heard in our first reading today. So, in a nutshell, the Church year goes from very first principles at the start and culminates with the realization of everything that the whole year has been leading up to. It is fitting that the Church year ends on this high note where Jesus has fulfilled everything required of him and is in his rightful place in heaven. But what do we know about how Jesus performs as a king? Based on the reading from Daniel, it is rather focused on the details of the choreography of the Throne Room up there in heaven. There are some thrones moved around so that at least one is available for Jesus, and there seems to be quite a lot of other extraneous detail about God the Father’s appearance. There are details missing that I would like to have known about. For instance, who moved the thrones into the throne room in heaven? Does heaven have some kind of janitorial staff, or a sexton of some kind? And where were the thrones before they were brought in? Are there store rooms in heaven? I’d kind of be interested to know…. Ultimately, though, what Daniel tells us is that the one with the appearance of the Son of Man – a prophetic vision of Jesus centuries before he was born – that this person is seated, rightfully, at his throne alongside the Ancient of Days, the one we know as God the Father. What is lacking, of course, is any detail about what kind of kingship Christ exercised. In short, what kind of a king was Jesus Christ? We have a great deal of information about this, all historical, because it intersects with other verifiably-known historical figures. The first of these is a puppet king of the Roman empire called Herod the Great. I’m not sure what is so very great about him, since he was evidently an insecure narcissist who was perpetually on his guard against any hint of being overshadowed in his role as King of Judea – a role which, it should be emphasized, he was only allowed to hold by the permission of the Roman Emperor, Tiberius, to whom having a vassal, puppet king, was useful for keeping some minor control in the hands of the locals, since Tiberius wanted to make sure that there were no uprisings that would destabilize his already rather shaky empire. Here we already have some hallmarks of human kingship: fear about being insurrection, anxiety about being upstaged by another, more potent, ruler. Herod the-so-called-Great, as we know from St. Matthew’s Gospel, is famous for intercepting some wise men from the middle East, who had seen evidence of a surprisingly significant astrological event in the region of Bethlehem, Judea, and had divined that the stars heralded the birth of a new king. Herod waylays the wise men, to find out more about this new rival to him. After they have left, Christian tradition tells us that Herod was so paranoid about this infant usurper that in order to destroy him, he orders the slaughter of all babies under the age of two. We also know that Joseph was warned in a dream to high tail it outta there, which meant that the Holy Family were well on their way of Egypt by that point. So, here we have the next set of hallmarks of human kingship: paranoia of being usurped, and becoming yesterday’s news, or worse. Ruthlessness in all its forms in order to preserve, at any human cost, that shaky clasp on power for as long as possible. Fast forward to Jesus as a grown man, proclaimed by his cousin, John the Baptist, and we have the slippery character called Herod Antipas, the son of Herod the Great, who was responsible for the death of John the Baptist, and then was part of a back-and-forth with the Roman authorities and the Jewish religious leaders at the time that Jesus was starting to become troublesome to them. 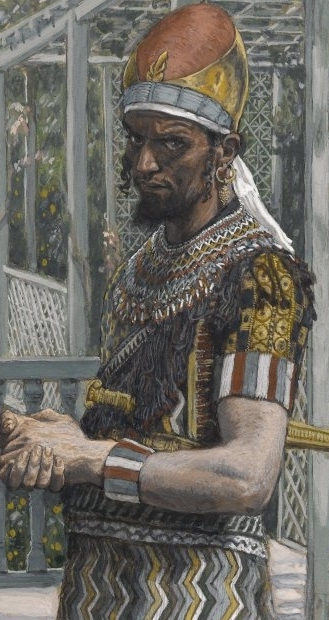 Herod Antipas had to be a Jewish as possible to the religious leaders, and as secular and cosmopolitan as possible to the Roman authorities in order to maintain the equilibrium that would keep his life drama-free. Getting rid of John the Baptist – this ascetic, radical upstart preacher who was starting to critique the Jewish religious leaders, would please those folks. Getting rid of Jesus would please not only those same Jewish leaders, who hated Jesus, but would also curry favor with the Roman authorities, who were very keen to stifle any kind of radical teachers who might upset the Jewish religious leaders. And here we have another set of hallmarks of human kingship: a desperate need to maintain the status quo and not do anything which would upset the applecart. An obsequious pandering to the important centers of power so that no one got upset and everyone could continue in the positions of privilege they had by hook or by crook got into. Finally, we have the exchange from our gospel reading today. Another frightened ruler, desperate not to get fired and/or executed by the Roman Emperor of the day. Pontius Pilate was an intelligent man. Intelligent enough to know that Jesus was a remarkable individual, and a blameless individual, who had committed no crime as far as he was concerned, yet was so terrified of the Jewish religious authorities whipping up a popular uprising based on Jesus’ supposed blasphemy, in claiming to be the Son of God, that he was willing to go against his better instincts, against what he knew to be true, in order to keep the peace in his province of Judaea, in order to save his own skin. (By the way, it didn’t work, apparently. Pontius Pilate was, in the end, recalled to Rome, and is reputed to have committed suicide in the reign of the Emperor Caligula). And so we have the final set of hallmarks of earthly kingship: a desire to cling on to power, and a pragmatic willingness to ignore the truth in order to advance one’s own agendas. Every single hallmark of earthly kingship is turned on its head by the life and work of Jesus. He was born in the last place you would expect a king to be born – in the lowest of the low – an animal’s feeding trough. He wasn’t concerned about clinging on to power. His power was derived from being a servant – being the lowest of the low. His power rested in not wanting power. He was concerned, above all, in telling the truth, whatever the cost. He didn’t care what the fallout was, telling the truth was more important, even if it cost him his life, which it did. Because he was free of all of the constraints of human kingship, he was not hounded by the paranoia of being usurped, nor was he imprisoned by narcissism. His power was derived, as I was saying, from being a servant, from being the lowest of the low. And from the very outset, Jesus was not concerned with any of the niceties and supposed expectations of how human kings were supposed to behave. When he was born, who were the first people to get to hear about it? Not the ‘great and the good’, but the deepest outcasts of society: what we would now term ‘the underclass’: shepherds. In the world of Judean society of the time, there was the lowest of the low, and then there were shepherds. This is what true kingship looks like. It is rarely emulated, if ever, in human society, but it is what it is supposed to look like. Our king, the king of kings, the ruler of the universe from before time and for ever, identifies with the lowest of the low, with the poorest, with the outcast, and then serves them. He brings them their food, he washes them, he binds up their wounds, he embraces them and wipes every tear from their eyes. This is the standard by which we ought to judge our earthly rulers. And if they don’t measure up to this – or, at the very least, concede that they ought to be emulating the model Jesus offers them, even if they fall short, well, we ought to be holding them to account on that, oughtn’t we?